If you need an excuse to eat coffee cake (and you'll settle for a thin one), you'll be happy to learn that today is National Coffee Cake Day. Here, 11 delicious recipes to make. "I add everything from fresh blueberries to chocolate chips," says chef Spike Gjerde. 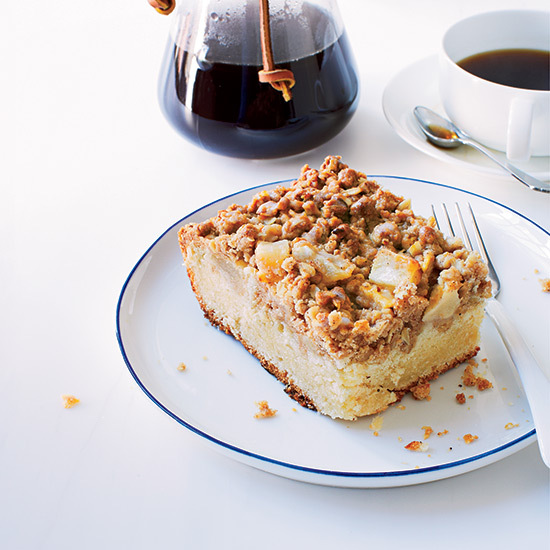 This moist cake is topped with a thick layer of cinnamony pear streusel. Star blogger Molly Yeh's incredible pound cake combines toasty matcha and a sweet almond glaze. F&W chef-in-residence Andrew Zimmern's lightly spiced crumb cake features caramelized apples and pecan-laced strudel. This terrific cake is topped with crisp, salty, buttery crumbs. Crunchy pecans laced with cardamom star in this fantastic recipe. How do you upgrade the classic pound cake? With rich swirls of chocolate-hazelnut. This foolproof cake is spiced with cinnamon and cloves. Crushed pineapple tops this amazing, gluten-free cake. Serve this cake plain with espresso or add a French touch by folding candied citrus peels into the batter. Blueberry preserves give this cake its fruity sweetness.